A 1980’s Schwinn Tornado bicycle gave me my first taste of independence. That black, orange, and yellow bike opened up a whole new world of possibilities to me. I could go farther, and get there faster. It gave me freedom to explore more of my neighborhood and town. Like most kids, everything in my life when I was young was time bound. There was always a curfew. Traveling faster meant I could explore more before it was time to come home. It wasn’t until I learned to drive a car that I experienced another leap in my understanding of time and distance the way I did when I was a kid on a bike. Learning to ride a motorcycle changed everything. Riding has its rewards, but it also comes with consequences. My more adventurous friends and I commandeered an open field near our neighborhood when I was a kid. One summer we carved out BMX style dirt course there using tools “borrowed” from our dads. It was complete with long downhill runs, sharp turns, and dirt mound jumps that would rattle your teeth when you landed. While riding on this track I had my first physics lesson in inertia (i.e. when your bike stops abruptly, but you do not), though I wouldn’t know it by that name until later in High School. I did learn that it hurt and didn’t do much for keeping a bike in working order either. My friends and I spent summer afternoons repairing our bikes (and licking our wounds) from the punishment the track inflicted. I eventually graduated from the Tornado to a Schwinn Predator, complete with bar pads, hand breaks, and a bright chrome finish. Tinkering, upgrading, and working on our bikes in each others driveways set the stage for later when I’d find myself doing the same thing in my driveway on motorcycles. To this day I blame the chrome finish on the Predator for my attraction to cruisers early in my riding career. In the late 1990’s my dad purchased a Suzuki Savage 650. The Savage was meant for my mother to learn to ride on, but she quickly decided being a passenger was enough excitement for her. My dad had recently fulfilled a life long dream of owning a Harley-Davidson and he wanted riding companions. His excitement at getting back into riding after many years was infectious and my sister and I caught the bug. She and I quickly took over the small motorbike and spent several Saturday’s with my dad in empty parking lots torturing the gearbox, lurching around, and running into curbs. After taking the motorcycle safety course my sister decided that riding wasn’t for her so I claimed the Savage as my own. I went over to my parents house, where the bike lived, as often as I could once I passed my riding test. I even “borrowed” the bike a few times when my parents where out-of-town. I was hooked. The Suzuki was not only the bike I learned to ride on, it was the fist bike I crashed on. Being a new rider I was over-confident and thought I understood the mechanics and physics of riding (see my previous lesson on inertia). It only took a cool, damp night and a steel manhole cover to show me how little I knew. My back tire hit the wet metal circle while as I leaned over coming around a bend to merge into traffic. It was just enough to lose traction. I slid along the road trailing the bike and we both came to an abrupt stop at the curb across the street. I was lucky (at this stage of my riding), as I was wearing a full face helmet, gloves, and a jacket. After checking myself out and finding no serious injuries I surveyed the damage to the bike. It was mostly roadworthy. I was close to my parents garage, so I got up, dusted off, and limped home. If you’ve ever wrecked a vehicle that belongs to someone else, especially your parents, it doesn’t matter if you’re 16 or 60, you know that special kind of dread that just sits in the pit of your gut. It is unlike any other fear. Having put more than my fair share of dents and scrapes on my parents cars as a teenager, I was all too familiar with this feeling. I figured my days of borrowing the bike were over. I’m glad that wasn’t the case. After convincing my mom that I was OK, my dad I went to the garage to look over the bike. The forks were a little askew, the foot peg and clutch lever were a little bent. A few minutes with a 5 lbs. sledge-hammer and a bit of muscling the bars and forks back into alignment was all it took to get the bike back in order. I felt like I was a kid again, sitting in a driveway, fixing a bike that had taken some lumps because I thought I was a better rider than I was. It took a little longer for me to repair my parents trust than it did to fix the bike. Visits with the Savage where to be supervised for a while. When I started living on my own in my 20’s, it took time to realize that I was truly “on my own”. I didn’t have to call home if I was going out late. I didn’t have to tell anyone where I was going when I left. This realization came to me in stages. Little boundaries that I tested and pushed at until I understood where my limits where. My riding experience evolved much the same way. First with hour-long trips on my fathers Savage, then to increasingly longer trips on other bikes I’ve owned. I slowly expanded my riding from day trips on the weekends, to commuting to work, and eventually to long multi-day overnight trips. The more I pushed and explored how far I could ride the father and more I wanted to ride. Understanding that my motorcycle was more than a machine but a means to explore and experience my surroundings in a new and exciting way. I wish I’d understood that earlier in my riding. I’d forgotten what I learned as a kid when I started riding bicycles, I just needed to remember it. This seems to be the case with a lot of things I knew when I was 8 and had to relearn as an adult. Since my first riding trips I’ve logged tens of thousands of miles commuting, weekend riding, taking road trips, and camping trips. I still get just as excited to ride today as I did the first time I went on a solo ride. I finally understand that riding a motorcycle is more than just puttering around back roads on a Sunday morning. It is a literal vehicle for adventure, for experiencing the world in a way that cannot be duplicated. When I ride my motorcycle I am part of the environment I am passing through. I can feel the weather, smell the trees, connect with the road and the scenery in a unique way. It’s hard as you get older to have new experiences. They come fast when you’re young because everything is new. Riding a motorcycle gives me the chance to reconnect with my 8-year-old self. To remember what it felt like to ride through my neighborhood and push against boundaries searching for new adventures. Winter projects are a way for me to spend time doing maintenance and other adjustments to my bike that I don’t get to during the riding season. One of those items is always a complete service: Oil, oil filter, air filter, check the tires, spark plugs, brakes, etc. I opt to do this during the off-season because on my Concours anything other than an oil and oil filter change requires removing a good amount of the plastic panels and other bits to get to the engine. I don’t usually have one full day to work on the bike, so it stays in a state of half dress until I can complete the work. That’s why this is a winter project. I hate missing a good day of riding because I don’t have time to put my side panels back on. One of the pieces I have to remove to get to the air filter is the windshield (I know, right). The Concours windshield is held on with small hex screws. Now, I’m going to admit this but I’m not proud of it, I have a cheap hex socket set. What this means is that smaller screws and bolts that I remove more frequently get damaged. Over time the hex heads get stripped and I have to get new screws. Simple solution would be to buy a better socket set, but that’s hard to justify when the screws are about a buck each. Yet another reason I work on my bike in the winter. I stripped the head of one of my windshield bolts recently and was unable to get the windshield off, thus not being able to get to the air filter, or the engine, and so I couldn’t complete my service work. I called my local Kawasaki dealer and they would only sell me a whole windshield kit that included all the bolts, mounts, and a new windshield. This was over a $300 and not really what I was looking for. So, off to the internet! I remembered a friend telling me that BikeBandit.com sold OEM parts and that I should check them out. Off to the site I went. I was pretty impressed with the site. After navigating to the OEM section I entered the make, model, and year of my bike and they had everything I needed. Their OEM section let me navigate to the specific area of the bike I was looking for to find the exact part number from a zoomable online parts diagram. This means I got to pick and order the exact thing I needed to fix my windshield. I found the screw, completed my ordered, and it was in my mailbox shortly afterwards. It saved me time and money and I’m glad I looked them up. BikeBandit.com has motorcycle tires, accessories, and even riding gear. They have aftermarket honda motorcycle parts, Kawasaki parts, and just about anything you need for you specific model of motorcycle whether you have a Suzuki, Yamaha, or BMW. Their low price guarantee will match any price if you find a part for lower than they have it. This is especially useful for motorcycle tires. I go through a set of tires every year and they are not cheap for the Connie. It’s to know that I can get the absolute lowest price around on BikeBandit. I’m hoping to restore a Kawasaki 1981 440 LTD soon. You can bet I’ll be spending a lot of time on BikeBandit once that project gets rolling, but that’s a story for another time. Currently their site, RoadMAPS.travel, has touring maps for Florida with plans to add New York, Ohio, Pennsylvania, South Dakota, New Hampshire, North Carolina, and Virginia soon. For more information visit their website RoadMAPS.travel or their FaceBook page or read the announcement at RoadRUNNER’s website. Bikes have always had a special kind of appeal to both people–even those who don’t ride. When getting a feature in a hit movie and ridden by a celebrity, it’s a combination that makes them a hit and integrated into pop culture. Remember the bike in E.T.? Of course you do! Even if you don’t remember it being part of the storyline, the iconic scene of the bike flying with the moon backdrop is tough to forget. Harley fans definitely would have picked out the FLSTF “Fat Boy” when it had a feature in Terminator 2. IMS Show not coming to Washington, D.C! That’s right, you read that correctly. The Progressive International Motorcycle Show is not making a stop in our nation’s capital this year. The closest shows will be in New York City, N.Y. and Cleveland, Ohio. There will be only 10 shows this year for the “world’s largest motorcycle tour show”. Other cities dropped this year were San Mateo, CA and Seattle, WA. Portland, OR. takes the place of Seattle, all other cities are the same as last year. It seems like a trimming down of the schedule the past few years. In 2013-14 there were 12 shows, 2014-15 there were 11 shows, and this year just 10 shows. This comes as a shock to me. This is the first time in my motorcycle memory that the IMS has not made a stop in, or close to, D.C. Needless to say I’m very bummed out by this news. I look forward to going to the show, getting to see the new bikes, and usually hanging out with a few friends for the day. Not this year. I know that NY and Ohio are certainly close enough that I could make the trip, but I’m sure it’s not as cheap as a Metro ride. I will now need to find some other mid-winter distraction for my motorcycle fantasies. Sena Technologies, Inc., a Bluetooth innovator in the motorcycle and outdoor actives market, debuted today the world’s first Intelligent Noise-Control (INC™) helmet EXCLUSIVELY to the media, dealers and trade members at the 2015 American International Motorcycle Expo (AIMExpo) in Orlando. AIMExpo has grown substantially since its inception in 2013, establishing itself as one of the fastest growing trade shows in the U.S. and the largest powersports trade show in North America. Likewise, Sena has shown impressive growth and innovation throughout the past three years, solidifying its position as the global leader in Motorcycle Bluetooth technology. 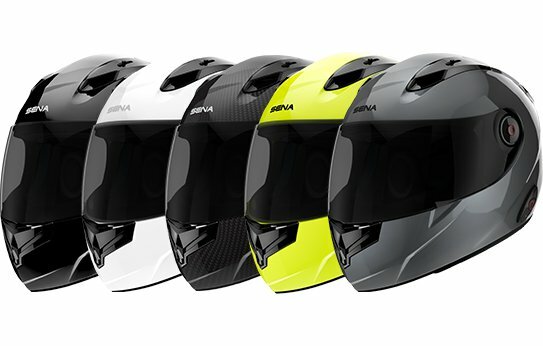 The Sena Helmet will be equipped with innovative smart technology with a premium comfort, ergonomics and finish. The ultra light-weight and durable carbon fiber material provides a high quality and comfortable experience, with ground breaking Intelligent Noise-Control (INC™) technology to actively control the loud and damaging noises associated with riding. “We are ecstatic to yet again be pushing innovation with the world’s first true quiet helmet, with our focus as always on creating the safest and best riding experience possible for our customers. It only seemed logical that we unveil this game-changing device at AIMExpo, a place where the entire motorcycle industry has gathered to see the latest innovations to hit the market,” says Sena CEO, Tae Kim. With all of the key features such as optional Bluetooth 4.1 Communication module, ultra light carbon fiber material, Plug & Play (PNP) installation feature for the INC™ and the patented Sena Bluetooth Technology, users can enjoy their ride like never before. Additional new products being showcased at AIMExpo include the 10S, 10R, 10U, Wristband, Handlebar Remote Controls, and Prism Tube. AIMExpo opens its doors to the general public this Saturday, October 17 (9 a.m. – 7 p.m.) and Sunday, October 19 (10 a.m. – 5 p.m.) where enthusiasts will have the opportunity to see all-new products from more than 500 unique exhibitors and demo a wide variety of two- and four-wheel, on- and off-road models at AIMExpo Outdoors!Tickets are available online at AIMExpoUSA.com or on-site at the Orange County Convention Center. Sena Technologies, Inc. is the global leader in Bluetooth Innovation for the motorsports, action sports and outdoor sports lifestyles – enabling real-time communication and optimal performance in the thick of the action. Since its first and flagship product, the SMH10 Bluetooth intercom/headset for Motorcycle helmets, the most cutting-edge technological designs have allowed riders across powersports and motocross to change the way they communicate while charging tracks and courses worldwide. With cyclists, action sports and outdoor sports enthusiasts taking advantage of its impressive communications and onboard technologies – coupled with its sheer innovation in creating new perspectives with Bluetooth audio action camera technology – Sena is enhancing the lives of speed demons and action-seekers for the better. Sena currently offers its products worldwide through its global network of distributors, retailers and OEM partners. For more information on Sena Technologies Inc. and its products, please visit www.Sena.com or contact (951) 719-1040 or marketing@sena.com. I have two daughters, two fish, three dogs, a house, a yard and all the commitments and upkeep that everything on this list require. Not to mention a full-time job, soccer, dance classes, summer camps, vacations, birthdays, school, etc. So, with all this going on how do I find time to ride? Most of the time it takes a little creative thinking. Riding to work instead of only riding on the weekend. This one is a no-brainer for me. I have to go to work, I have to use a vehicle to get there, why not take the bike. While it’s not carving up curvy mountain roads, it is riding. I use commuting to hone my defensive riding skills. I get to practice situational awareness, lane position, anger management, creative sign language, and other essential commuting skills. I think of it this way, most of the trips I take I’m trying to get somewhere and I have to ride to get there. Commuting is just practice for those days when I have to slog it out on the highway to get to that sweet mountain pass tucked into a state park where the rangers haven’t found a place for the speed trap yet. It also beats the heck out of not riding. Early morning can also be a way to sneak in a ride. This falls outside the normal times most people ride, but I can get up on a Saturday at dawn (5:30 am) get in a 3 1/2 – 4 hr ride and pull in the driveway at 9:00 – 9:30 am, just as my family is getting ready for breakfast. I get a nice ride in and still have the rest of the day to take care of the yard and shuttle the kids around to their swim meets, soccer games, or other obligations. This one takes a little more planning. I look for loops that are pretty specific in their time and mileage. These are not the lazy all day Saturday rides where I can take new and interesting roads on a whim just to see where they go. I have to choose routs where I’m sure of where I’m going and how long the ride will take. Who doesn’t like planning new routes though? The trade-off here is that I will sacrifice some sleep, but for me it’s worth it. Another option is to run errands on my bike. It’s not always the most exciting riding but it’s better than sitting in my garage staring at my bike and wishing I was riding. With panniers and a top box I have a lot of room to haul pretty good-sized loads. Even for the not so big stuff like running out to grab a RedBox DVD is a chance to ride. 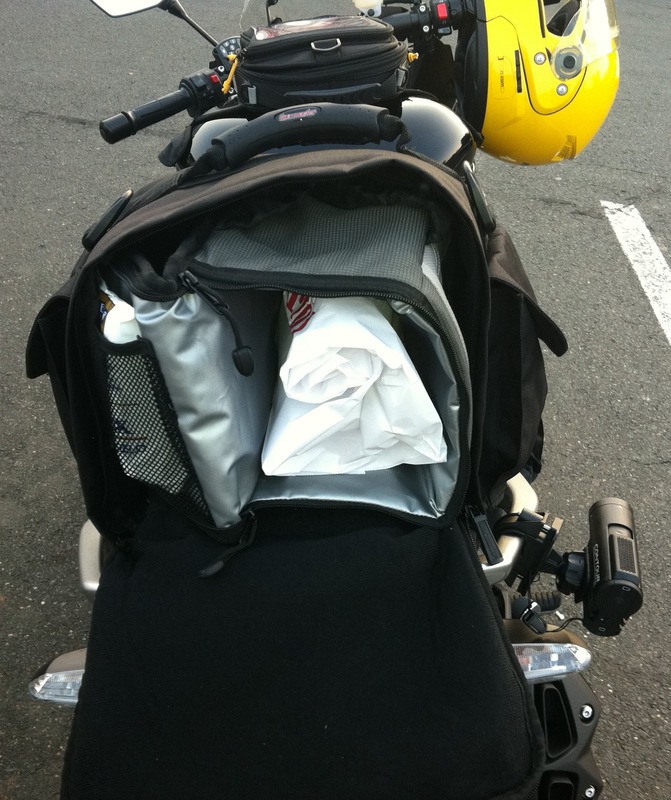 I once rigged up a cooler to fit on the back of my Ninja 1000 so I could run out and get ice cream for my wife and I. Worked great and I got a little dusk-time, after dinner riding in. I call that a win-win. Trading time-off with my wife is also a way to get a longer ride in and still make it fair to for everyone. This is a negotiation and planning process (in terms of the ride planning, not the negotiation planning). My wife and I sit down with our schedules and take a look at what week or weekend I want versus what time she wants or her own hobbies. We barter and trade so we both get some personal time and space to do our own thing. I find this the most equitable way for us to get time to do things we love and still feel like we are partners. Even with all the obligations of a family, house, yard, and everything else, there are many ways to still get riding time in. I manage to get in about 7,000 – 10,000 miles a year using the tips I’ve talked about. There are many who ride more, but at least I’m riding. We always find time for the things we love. Can You Be A Nerd And Ride A Motorcycle? 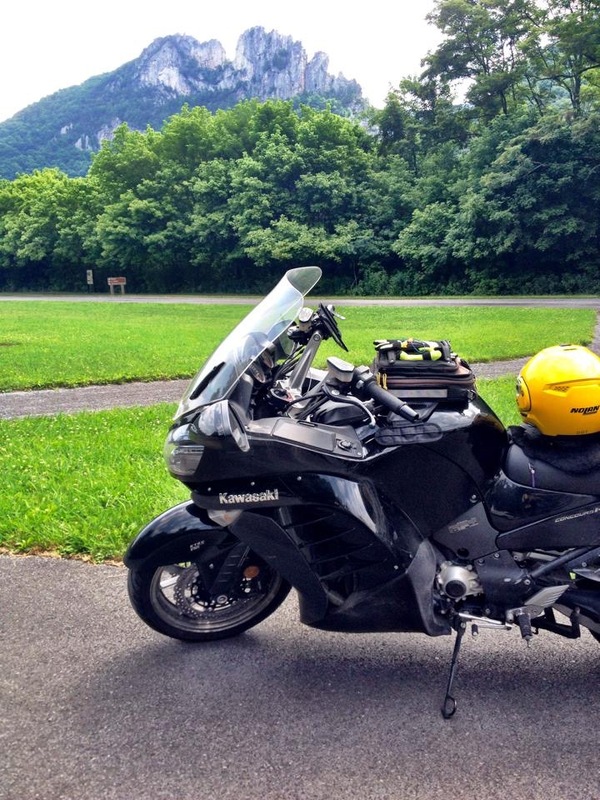 Motorcycle touring and its lessons in turn. CouchSurfing my way across the 50 states of America and 10 Provinces of Canada. Freedom and the open road. All The Things We Love (and Hate) About The Eighties!